Home / Blog / Collection / Achieving ROI with Your Recycling Program. 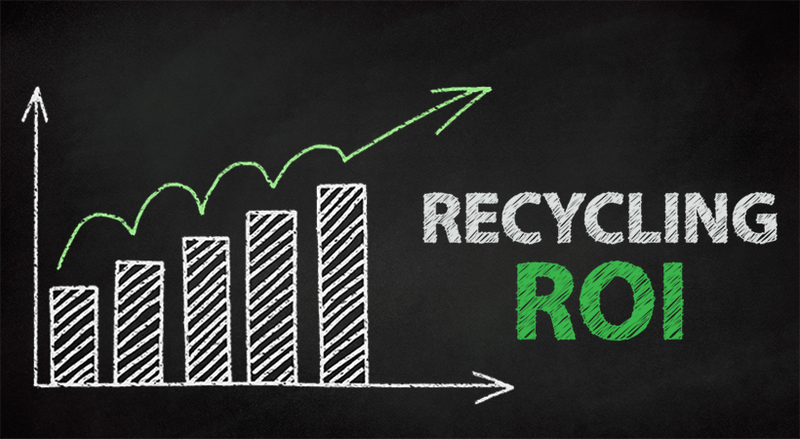 Achieving ROI with Your Recycling Program. The biggest barrier for implementing an effective recycling program is often the capital investment required. Because recycling programs are often thought of as a “nice to do” rather than a financial investment, they are often not given priority for budget allocation. In reality, however, effective recycling programs can generate revenue for an organization and payback the initial investment in as little as 2 years. Substantial savings can be made in custodial costs when you move to centralized recycling stations because the stations take less time to service than desk side bins and require considerably fewer bag liners. By looking at how often your waste is collected, and then changing your collection schedule so that bins are only emptied by your waste hauler when they are full, saves a significant amount of your waste hauling costs. White office paper is the highest grade paper for recycling with a value of approximately $145-150/ton. Organizations that recycle large amounts of white paper often negotiate a rebate from their waste hauler for this item due to its high market value. Old Corrugated Cardboard has an approximate market value of $105-117/ton. Similar to white paper, organizations that recycle a large amount of OCC from packaging can often negotiate a rebate from their waste hauler. Another option is to bale the cardboard onsite and sell directly to recycling centers. Through these cost avoidance measures, a recycling program can easily generate ROI and pay back the initial equipment costs within a short period of time. After the payback period is completed the program then generates ongoing revenue through the recycling rebates that are available. To get your recycling program making you money, call us today at 1-888-646-4246 or email us at solutions@cleanriver.com. *Payback periods will vary depending on waste hauler contracts and recycling rebates available.